University of Michigan head coach Jim Harbaugh is undefeated in 2016 and has made a splash in college football in his second year at the helm of the Wolverines. Even after four seasons in the National Football League, Harbaugh thinks outside of the box and always seems to make the right move. He is starting to brand himself as a coaching icon as we know it. Little things like what he wears help reinforce his image. Harbaugh is turning heads in recruiting too. Lets be honest if you know football, why wouldn’t you want to play for the guy? 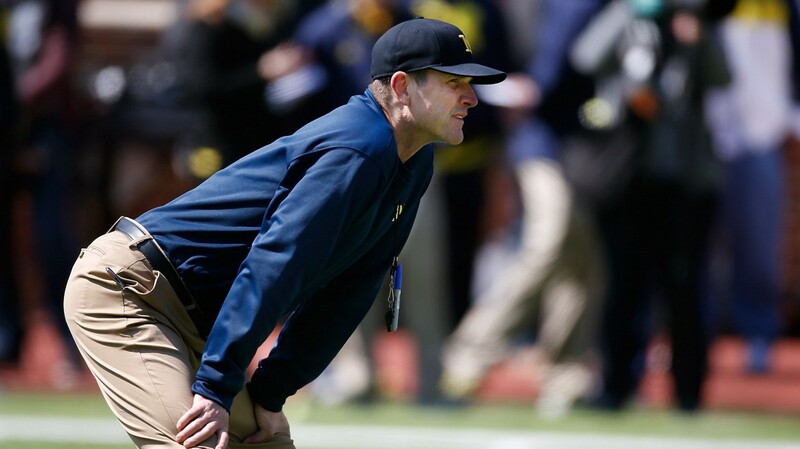 Michigan has reverted back to a blue-collar scheme paired to a new way of thinking. He has recruited the personnel to execute his pro-style offense in addition to a stout defense giving up less than 100 yards on the ground. The offensive success is coming predominantly on the backs of the big fellas up front. Michigan tallied 25 touchdowns and over 250 yards per-game rushing in first six games this year. Granted these numbers come due to five blow outs thus far, but those numbers correlate to the physical nature of the Wolverines. Wisconsin has been the only team to match Michigan’s grit for 60 minutes. The Wolverines clinched a seven point victory with two interceptions in the final five minutes. Size, strength, and speed of the Wolverine football team is admirable for a new coach to assemble in his second year. There have been tons of new coaches that have success in their first years, but Harbaugh stays winning off the field. Harbaugh’s staff has done amazing things in the digital area of recruiting. Coach Harbaugh’s Twitter account helps keep recruits informed with new things happening around the university, and all of the fun activities the football team is doing. In all reality you are trying to sell 18 year-old kids to come to your college, and they buy what they see. Coach recently had a slumber party with a kicking recruit. The recruit told Coach Harbaugh that his room was filled with Penn-State memorabilia where he replied, “Don’t worry, I will help you take it down.” More recently Harbaugh was spotted this last weekend working the chain gang in the Bay Area of California. Michigan had their bye week and Harbaugh thought why just show up, when I can work the chain gang? What might seem like a small cork shows how to gain positive attention to his recruiting. The Big House alone can attract players to come play at the Big-10 power school. Imagine this Wolverine team in fiveyears with this coaching staff.